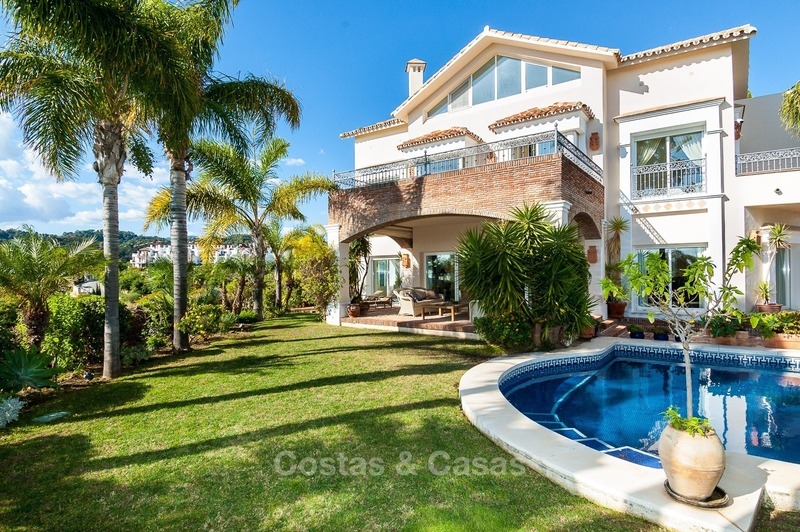 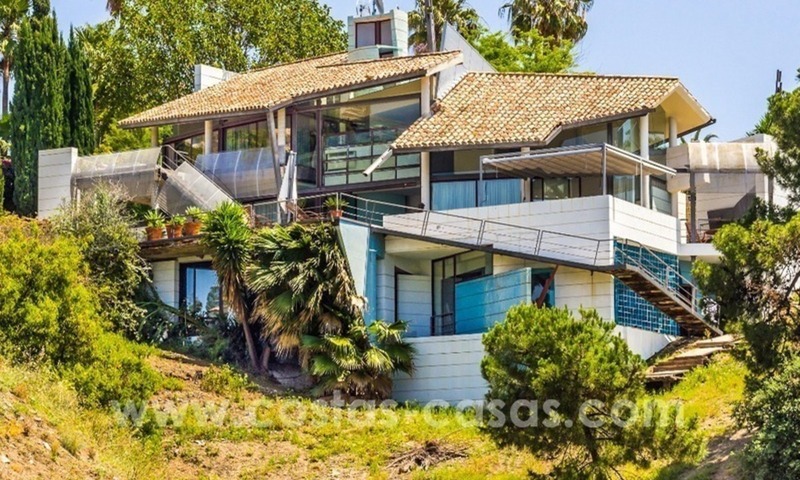 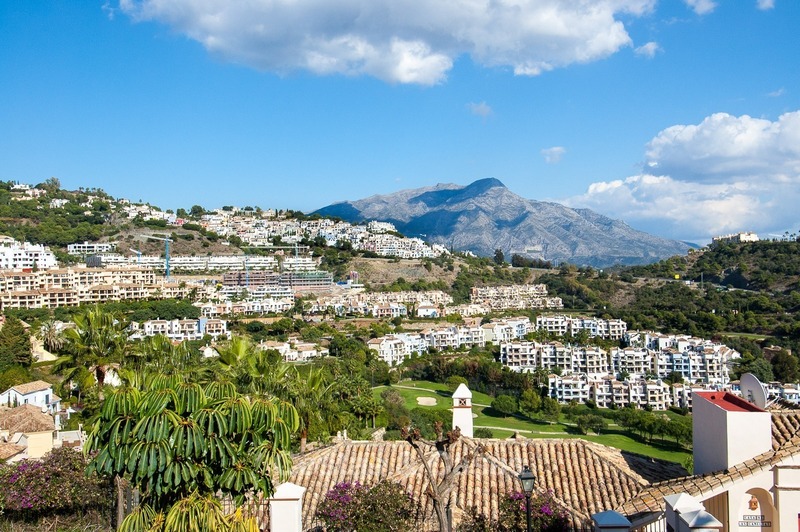 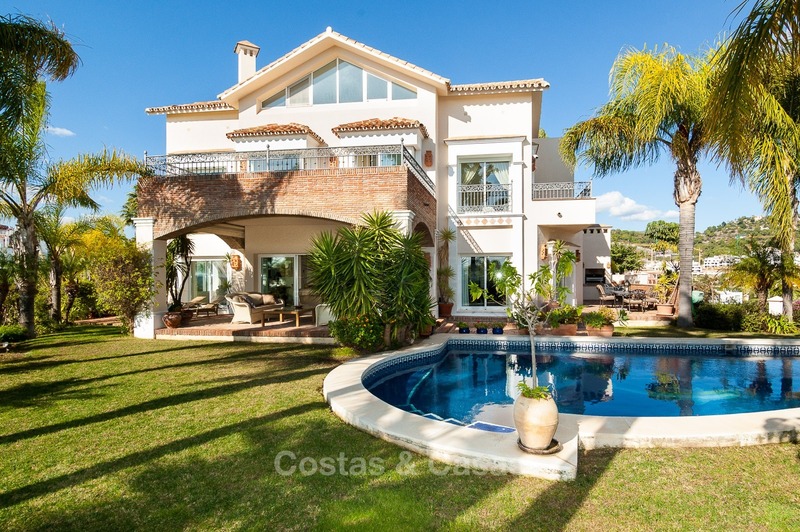 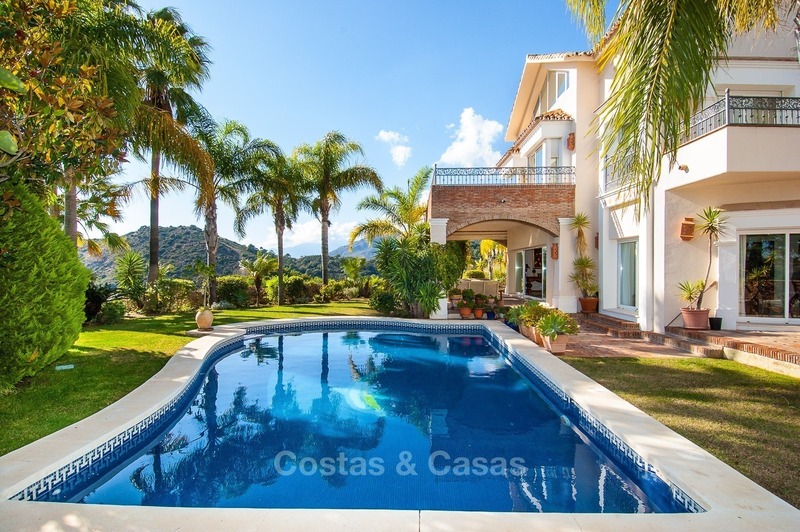 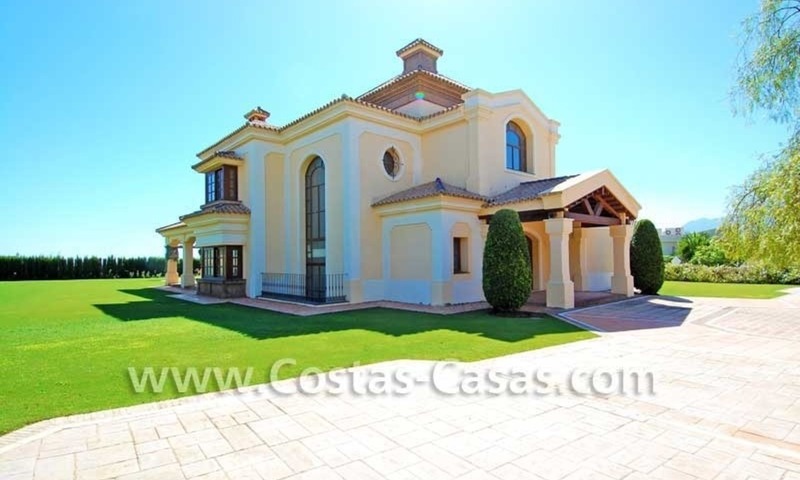 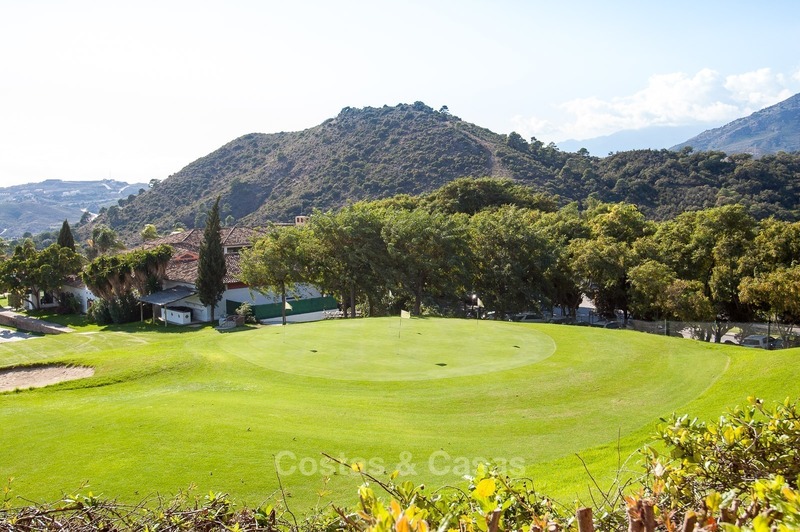 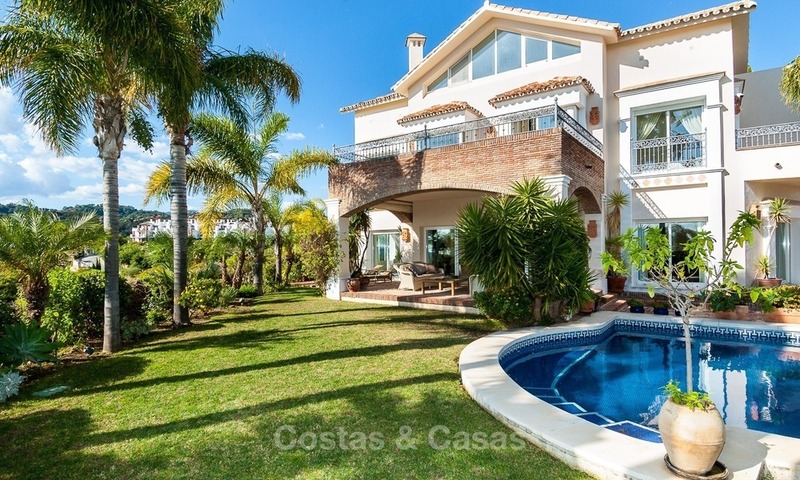 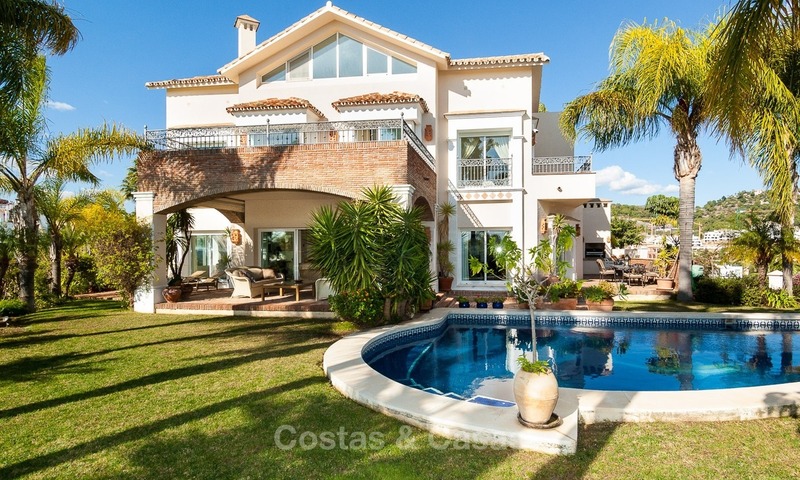 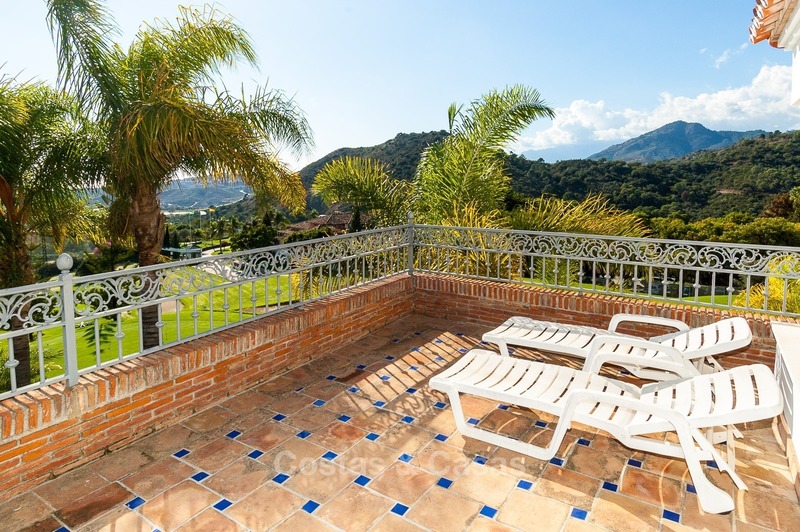 High quality built, 5 bedroom, 5 bathroom villa, frontline golf, elevated plot, located in a cul-de-sac in Benahavis - Marbella. 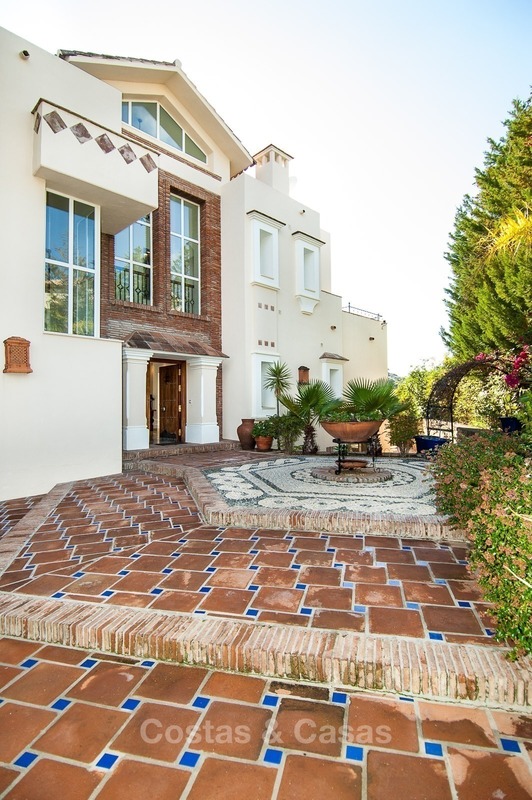 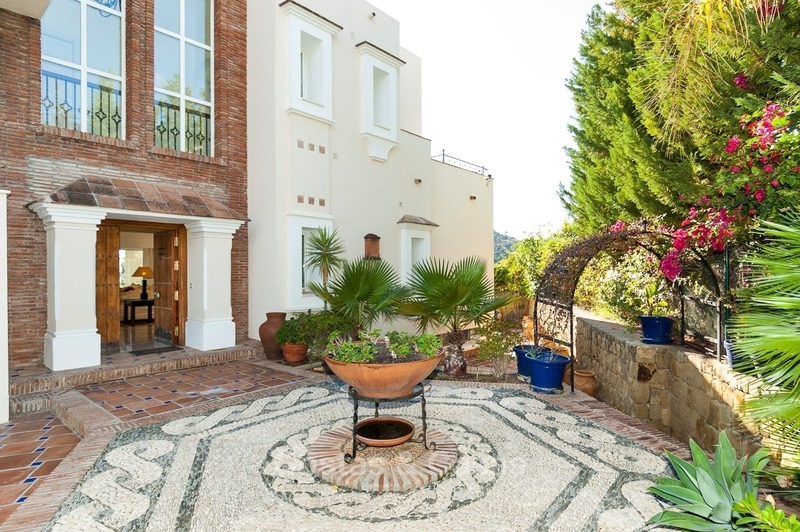 A lovely entrance created by an artist from Cordoba leads you to the double height entrance of the villa, where immediately the view towards the Mediterranean Sea, mountains and the Golf course take your breath away. 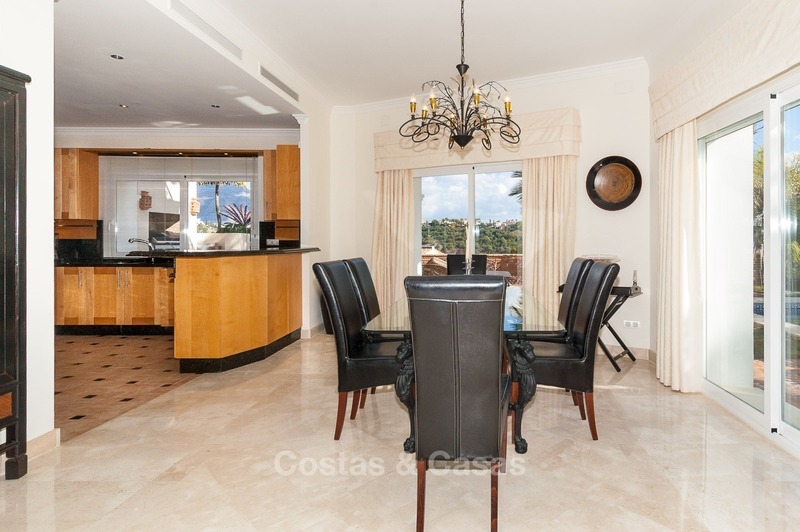 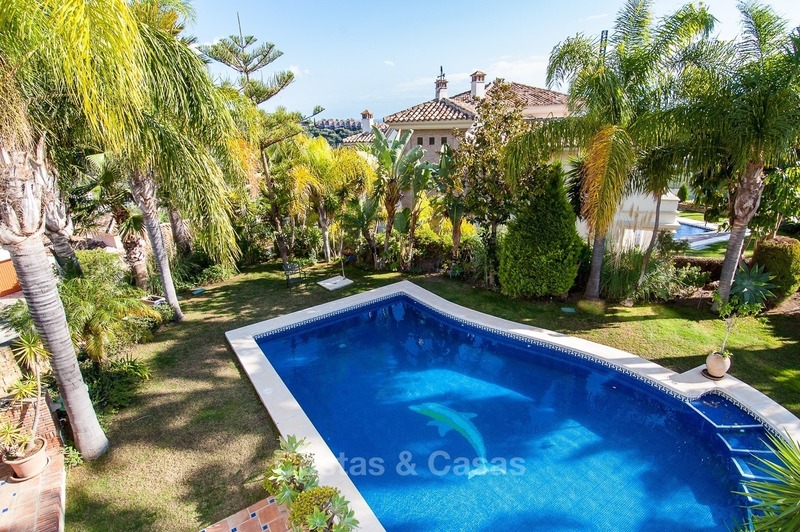 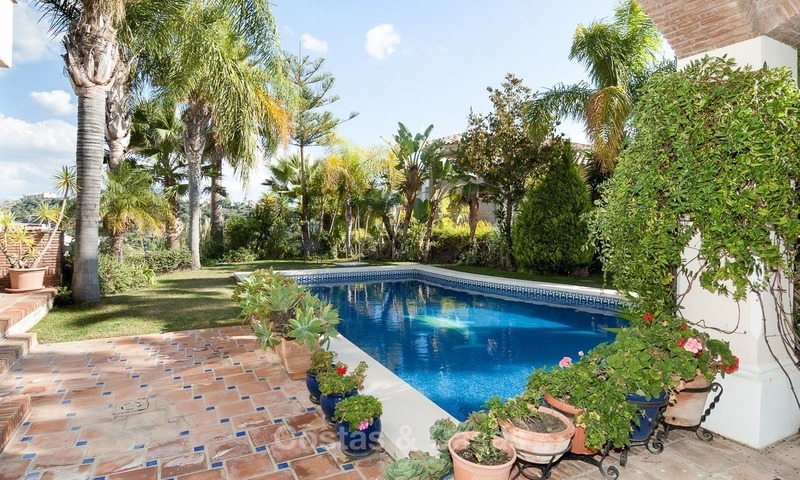 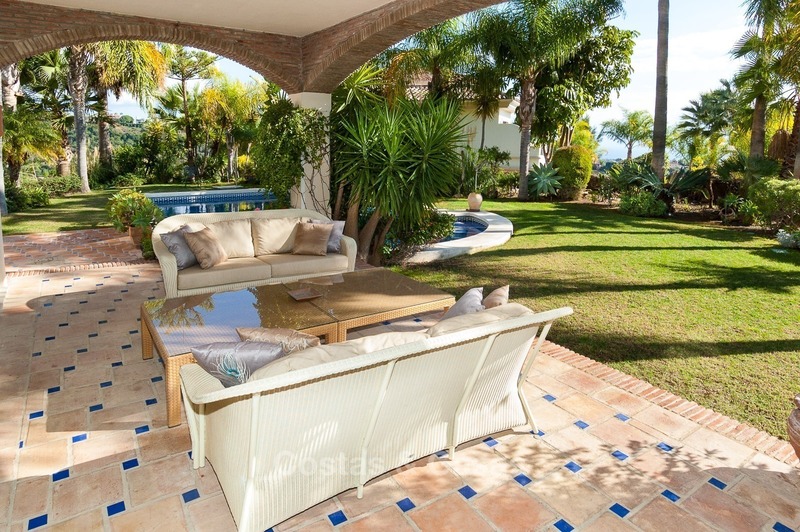 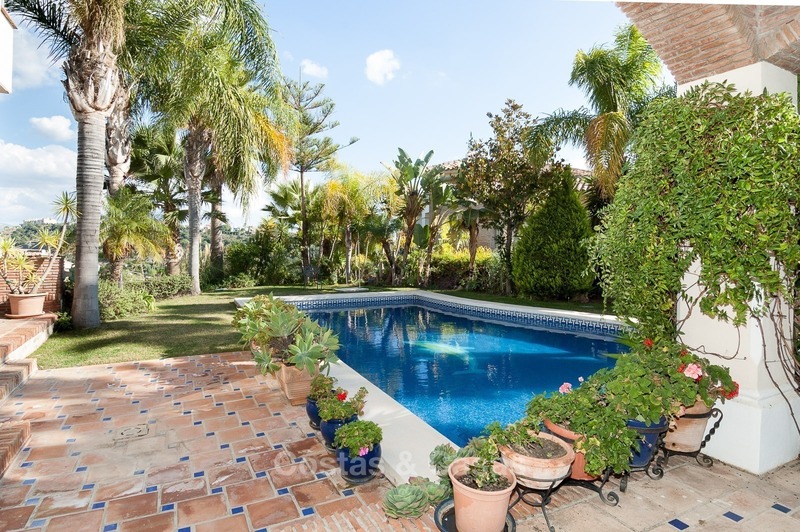 Beautifully landscaped garden with mature vegetation and palm trees, swimming pool 10m X 5m. 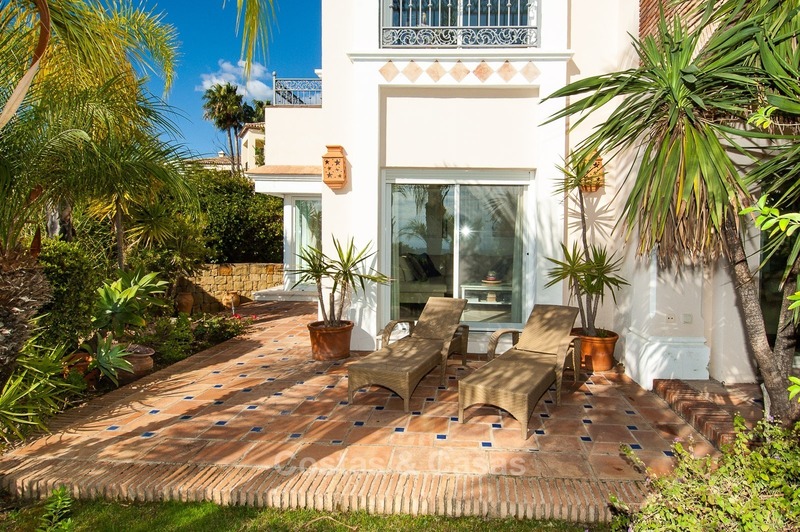 Very private garden with plenty of terraces all around the villa to enjoy either the sun or the shade at any moment of the day. 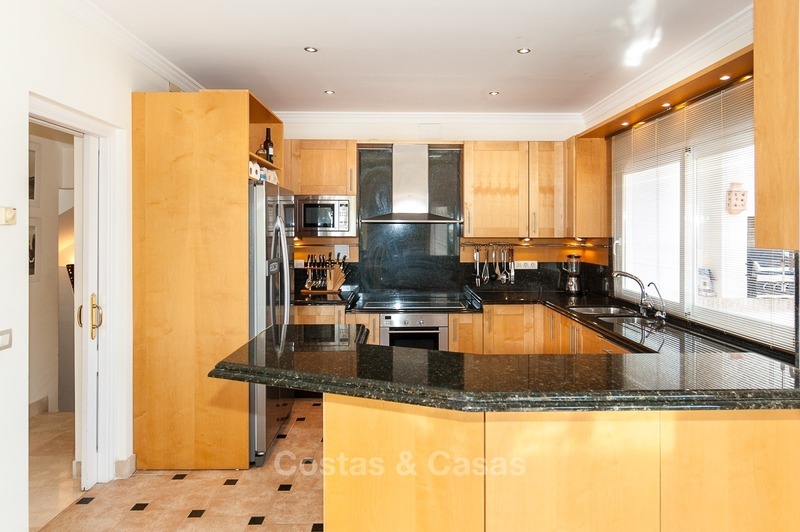 On the ground level we find an open plan living-/dining room with on the left-hand side a breakfast bar separating the kitchen, featuring solid wooden maple cabinets and black granite counter tops. 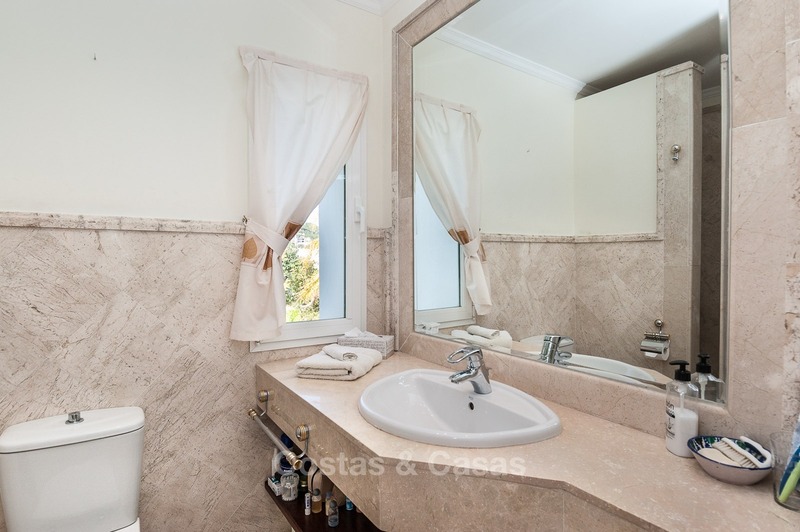 Siemens appliances. 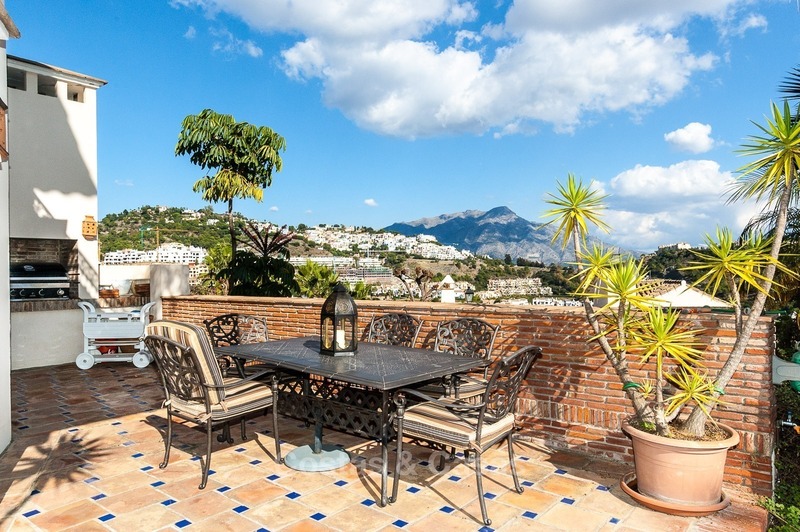 Off the kitchen there is a built in BBQ on terrace. 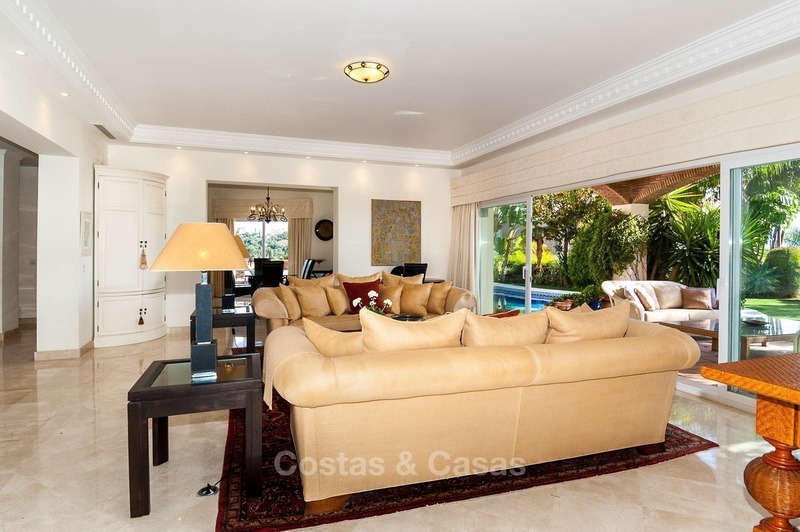 On the right-hand side you find a separate den which is used as a TV room. 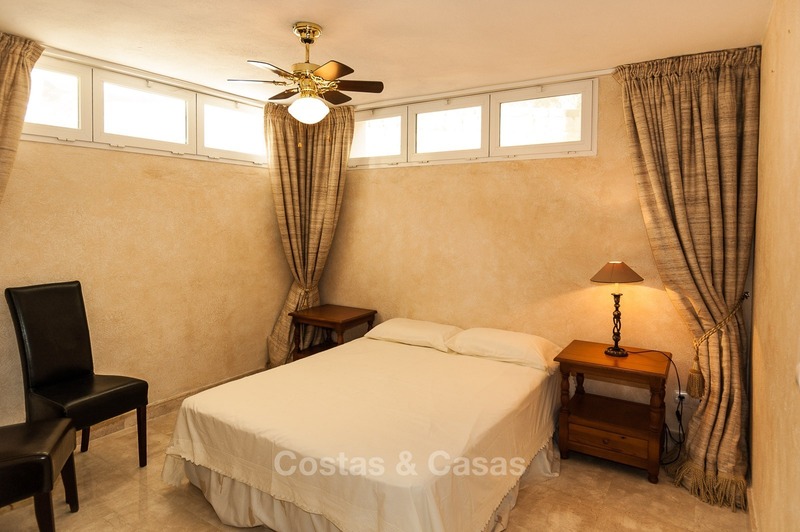 This room has a pre-installation chimney for a fireplace. 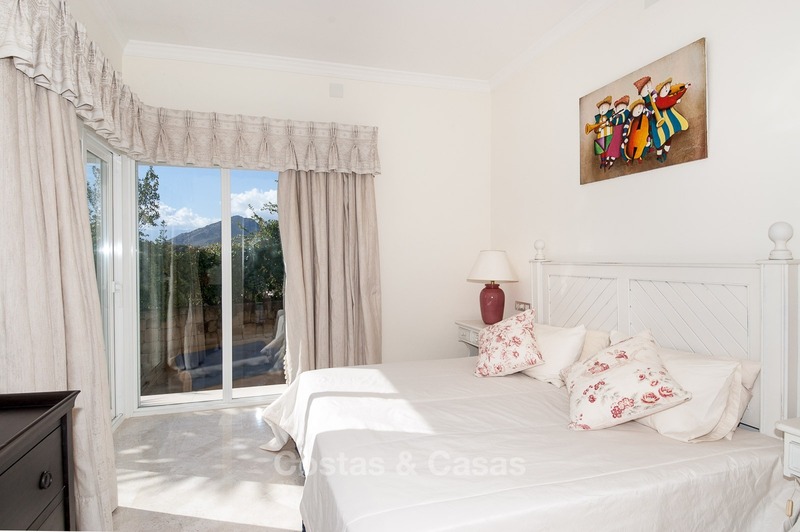 There is a double aspect en-suite bedroom facing south and west with fitted wardrobes and a deep storage cupboard. 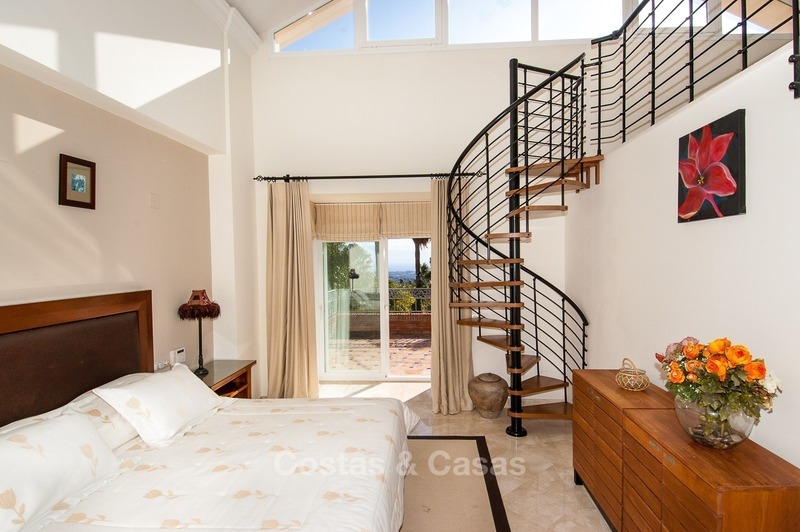 On the first level we find the master bedroom with a mezzanine, currently used as an office. 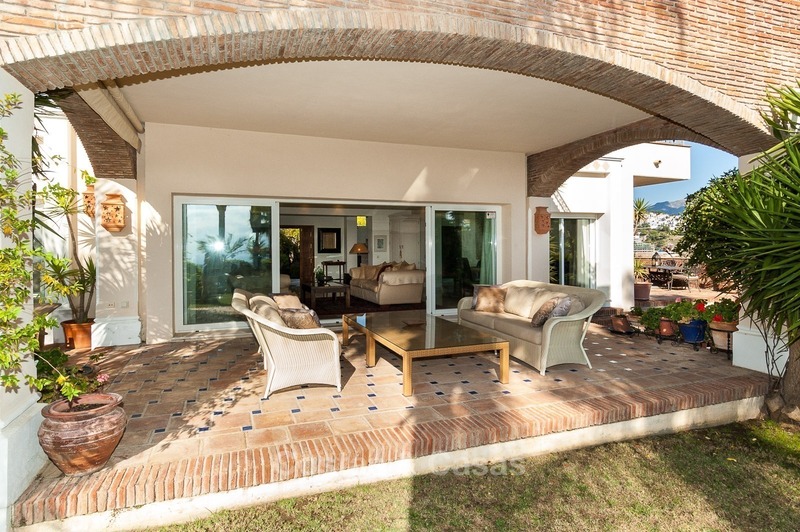 Bay patio doors lead onto a large terrace, south facing with panoramic sea views. 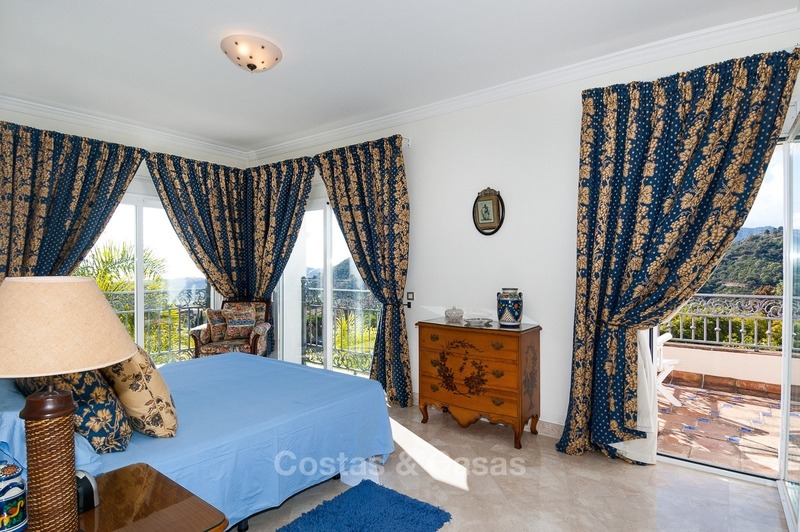 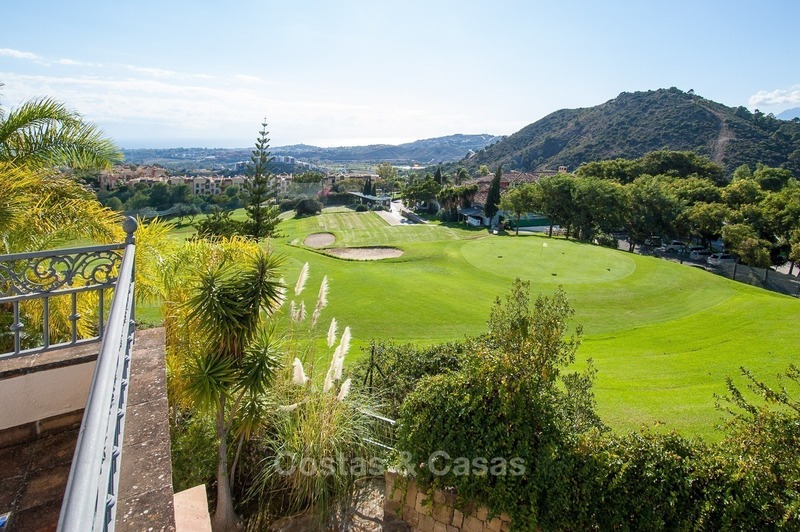 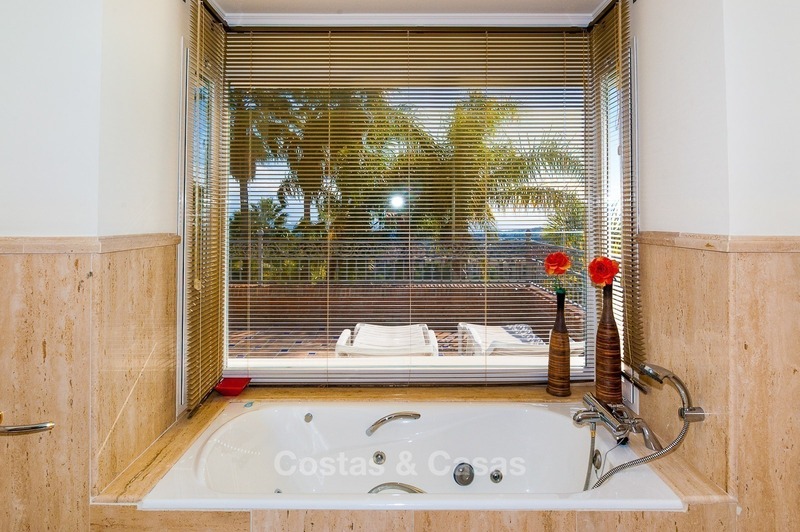 A spacious double aspect east and south facing en-suite guest bedroom with own terrace and views to La Concha, golf and the sea. 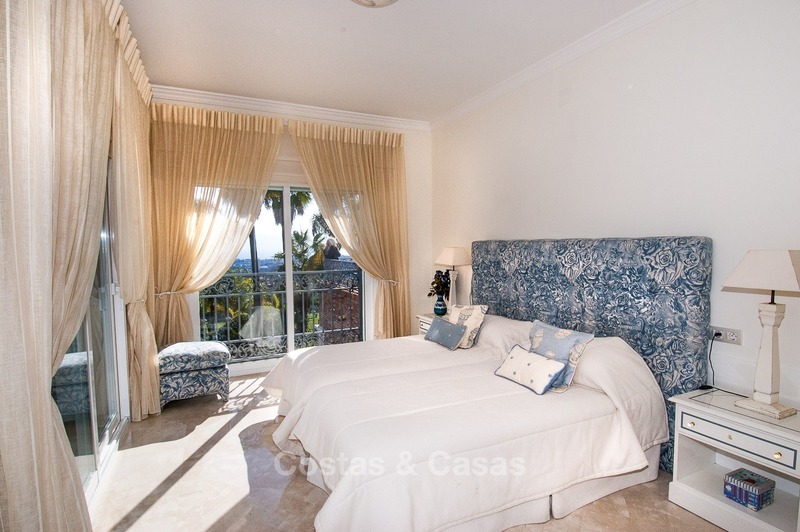 The 4th en-suite bedroom is a double aspect, south and west facing room with private terrace as well. 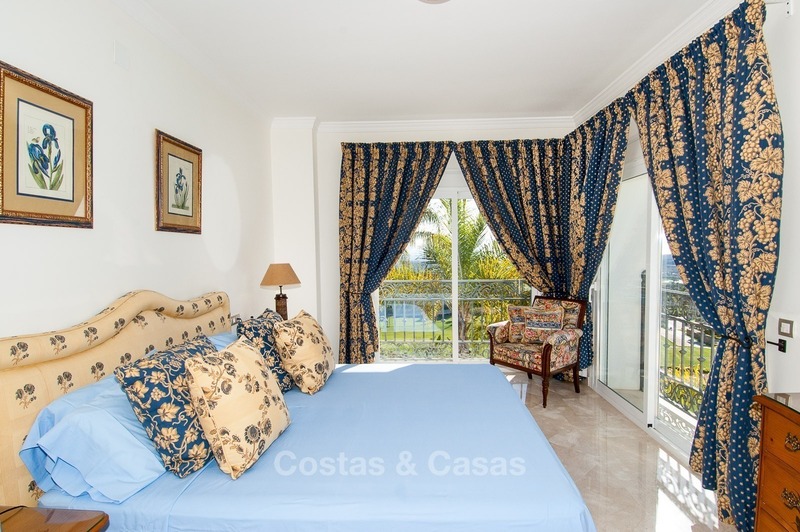 All rooms come with fitted wardrobes. 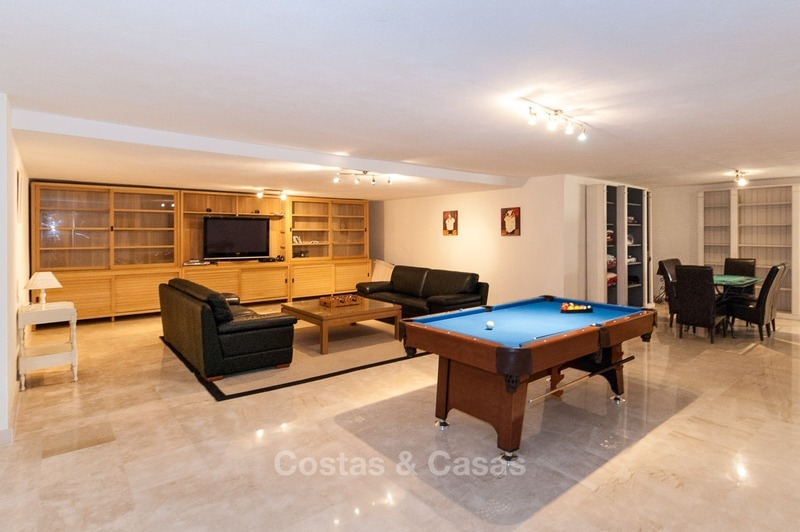 The basement features a large entertainment area currently used as a TV and game room. 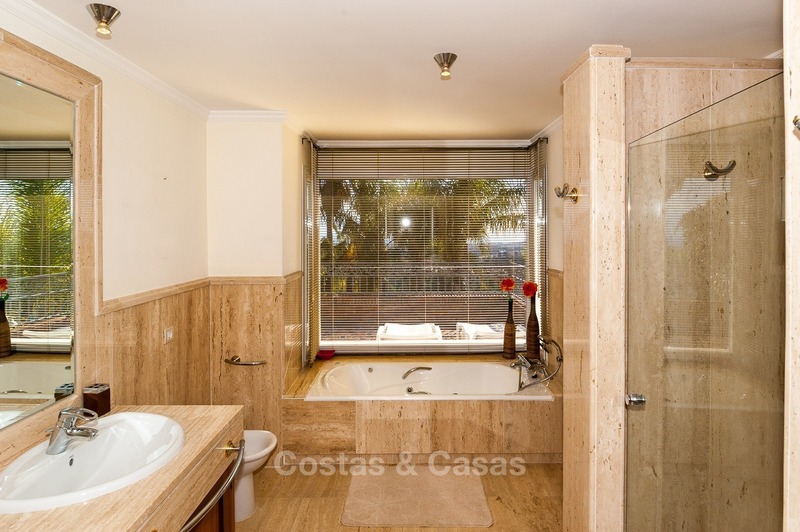 There is a 5th bedroom with natural light and a separate bathroom. 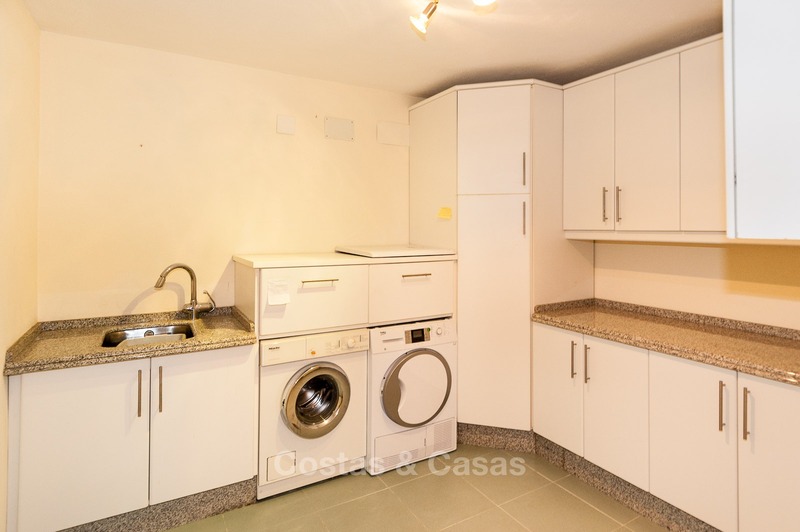 A small bodega and a spacious utility room with lots of storage. 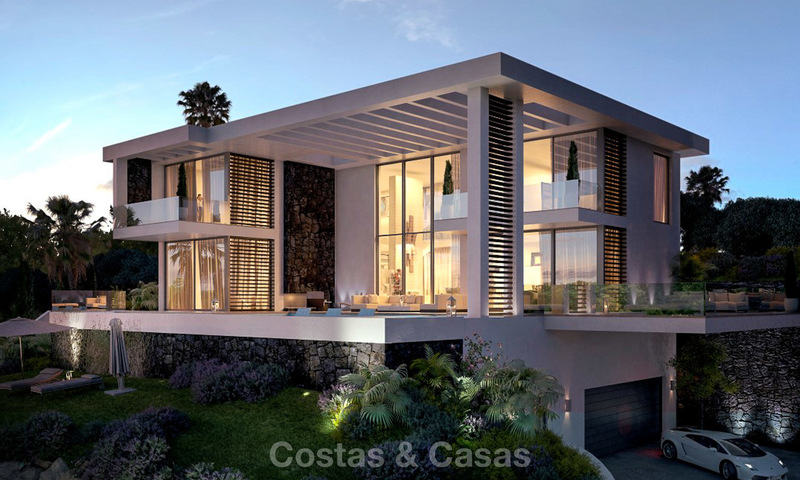 Automatic double doors 2 car garage including fitted cupboards, worktop and storage racks, driveway for parking 2 additional cars plus ample street parking. 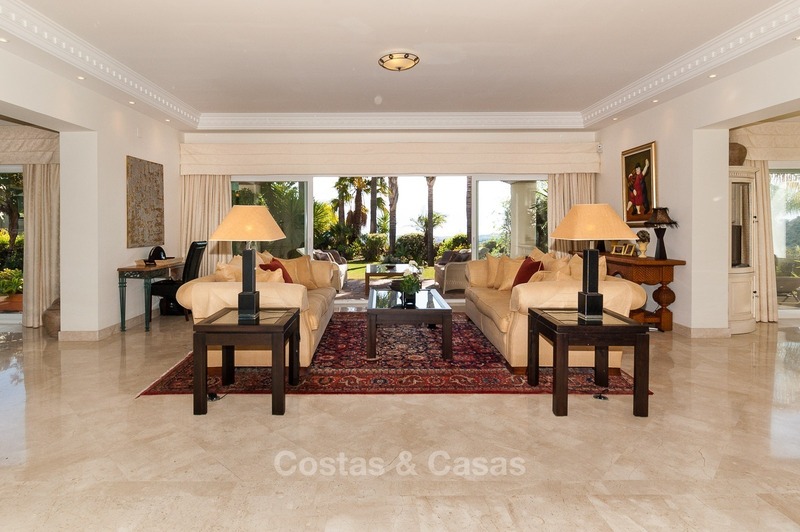 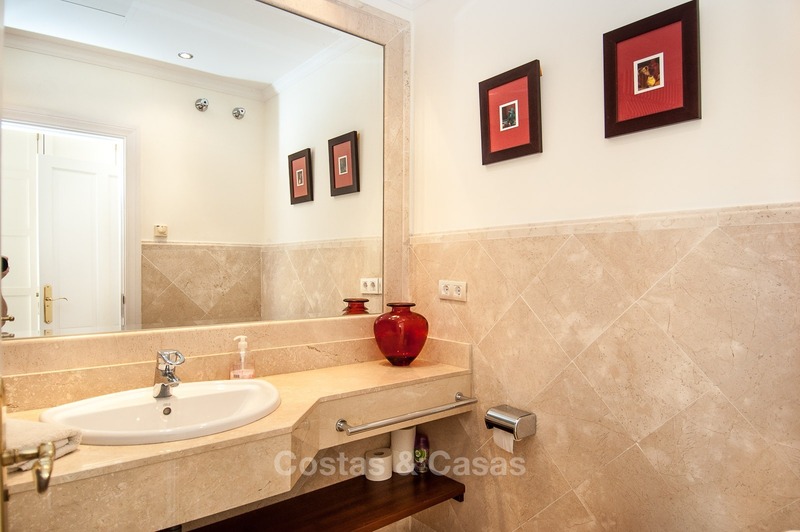 Cream Marble flooring throughout with diagonal design, porcelain tiles in the kitchen and terracotta on the terraces. 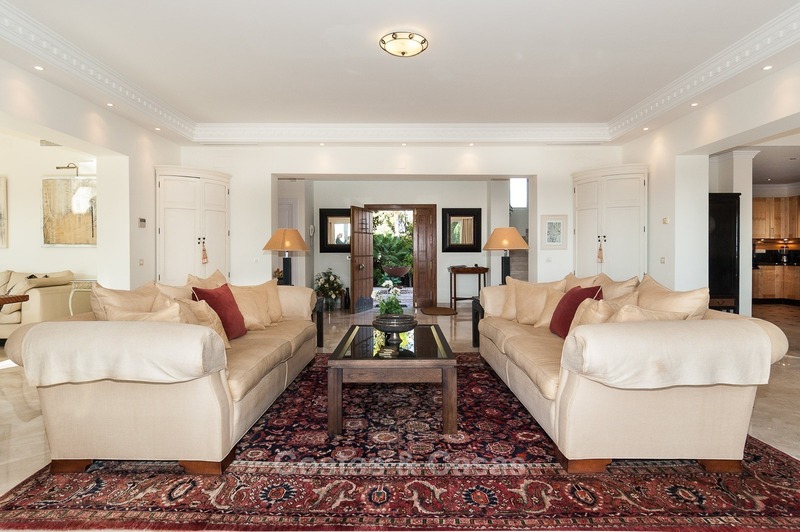 Full Underfloor heating (apart from the basement) which can be managed per room. 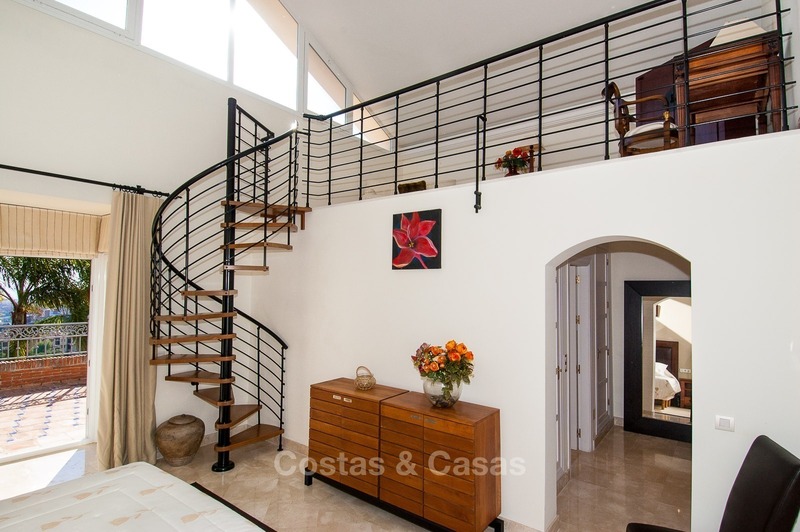 Hot and cold air conditioning which can be managed per floor. 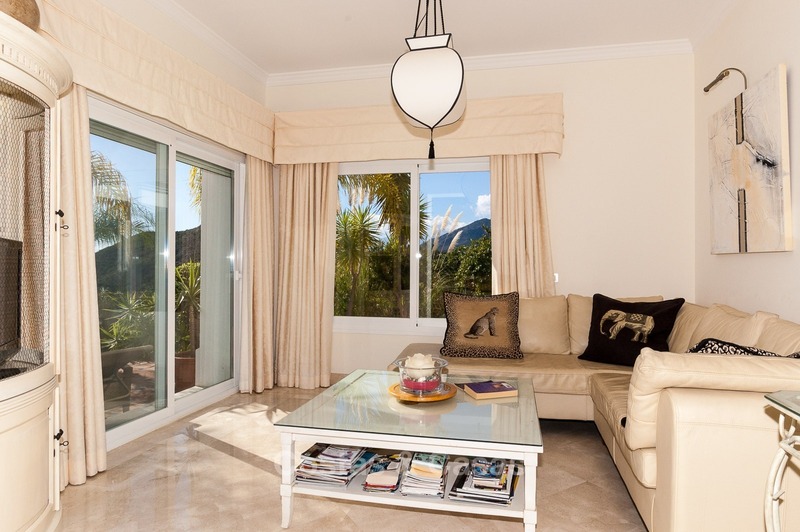 Electric roller blinds, Video porter entrance. 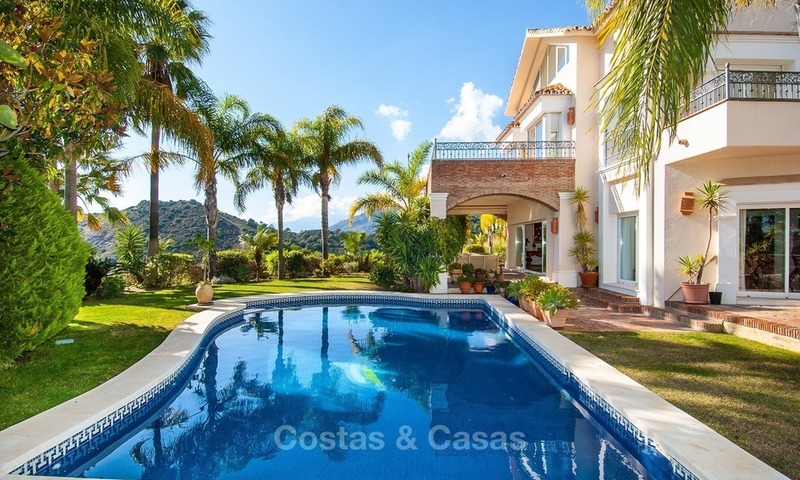 Emergency Water deposit tanks, Water purifier and softener, White lacquered aluminium double glazed windows and sliding doors, automatic irrigation system and lighting throughout the garden, Alarm, Automatic remote controlled gates, pool room, 24 hour gate and roving security. 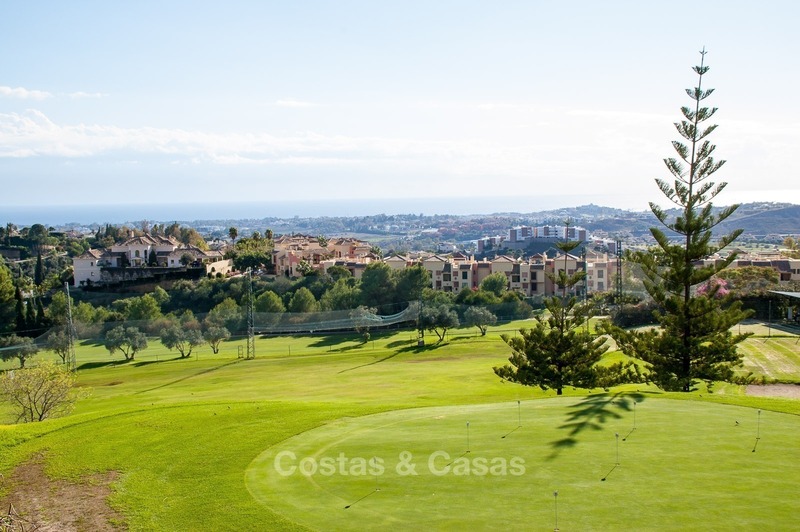 Golf resort with Club house with restaurant, golf, tennis and gym facilities.